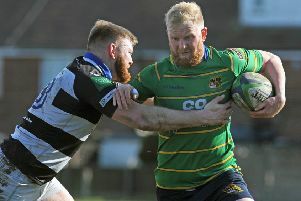 Fleetwood gave their best display of the season to win a keenly-fought North Lancs Cumbria League clash in which only one try was scored. After the narrow defeat at Trafford MV the previous Saturday, Fleetwood realised a massive performance was required to beat top of the table Aspatria. Within the first few minutes the Green and Golds were under pressure as the Black Reds mounted attacks which were only thwarted by some excellent defending. However, with just 10 minutes played Aspatria secured a lineout deep in home territory and recycled the ball to score a try down the blindside wing. The conversion was missed. Fleet’s new-look backline was well marshalled by Luke Wilson, who was linking well with Canadian Gavin Rowell. Full-back Zac Coultas was in the thick of the action, as was the centre pairing of Tom Wilson and Karl Bowling. Harry Baker, the star man against Trafford, was also lively with ball in hand, penetrating into the Aspatria half with his mazy runs. After a period of sustained pressure, Fleet were finally rewarded with a penalty. Richardson nudged his attempt through the uprights to cut the deficit to 5-3. Although the Black Reds had the edge in the scrum, Fleet were functioning well at the lineout and Andy Holme was providing accurate ball to jumpers Rob Brookfield, James Lilley and number eight Richardson. And it was Richardson who broke from the base of a scrum, beating a number of defenders. With just one more player to beat, Richardson attempted to feed winger Kris Phillips but he could not take the pass. However, a few minutes later it was Richardson was helped himself to another three points courtesy of a penalty to edge ahead 6-5 at half-time. Whatever the Aspatria coaching staff said to their players at half-time had an immediate impact, their burly centre cut through before offloading for a try. The conversion was missed but the Cumbrians were back ahead at 10-6. Again, back came Fleet, with their excellent ball-carrying props Peter Benny and Ricky Newton helping the team to drive forward. The constant pressure paid further dividends as another penalty was awarded to Fleet. Richardson made no mistake to cut the deficit to a single point. At this stage, the back row was creating plenty of go-forward momentum. Alongside Richardson in the back row, flankers George Orry and Mike Kelly were causing problems for the visitors. An attempted interception by the Black Reds flanker was adjudged to have been a deliberate knock on. Off he went to the bin for 10 minutes, while Richardson slotted his fourth penalty as the lead changed hands once again. The final 15 minutes of the game witnessed Aspatria throw everything including the kitchen sink at Fleet. Eventually, the referee blew his whistle, much to the relief of head coach Steve Woodburn, who was delighted by the attitude and discipline shown by his weary troops. Selecting a man of the match from the game was a tough decision as every single player could justifiably say they deserved it. That said, for the number of tackles he made and the metres gained carrying the ball, young flanker George Orry took the award.